The must-see movie at Birmingham cinemas this weekend is Avengers: Age of Ultron, the much-hyped superhero sequel in which Iron Man, Captain America, Thor and their long-underwear chums must save the world from a robot megalomaniac who sounds a lot like James Spader. 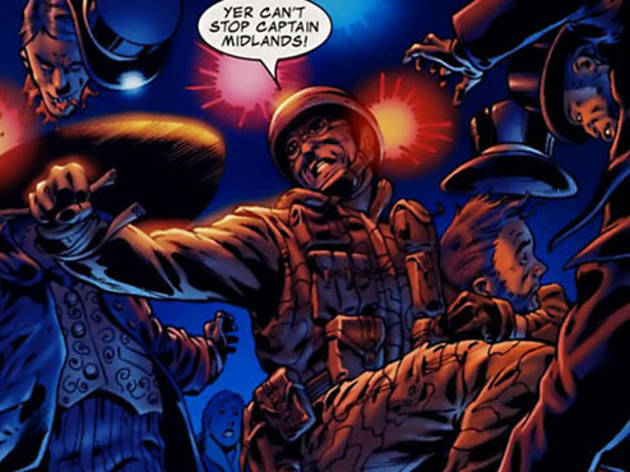 While The Avengers have Captain America, Birmingham has its very own Captain Midlands. This is not a hoax, not a dream, not an imaginary story… this is a genuine thing that’s been published in a real-life Marvel comic. Yes, the sprawling Marvel Comics universe actually contains a patriotic, shield-slinging, living legend of World War II who is also a Brummie. As you might expect, the character shares a similar WWII backstory to his more illustrious American counterpart – Captain America was really Steve Rogers, a scrawny young idealist from Brooklyn who was transformed into a ‘Super Soldier’. Captain Midlands, on the other hand, was really Sid Ridley, a scrawny young squaddie from Hodge Hill transformed into a ‘Bostin Battler’. Unlike Captain America, however, Sid wasn’t cryogenically preserved for decades in a block of ice but instead grew old and increasingly uncouth and belligerent. More Steve Bruce than Steve Rogers, he became Marvel Comics’ version of that miserable old bloke on the Number 11 bus, but considerably more ripped. No one ever said that about Captain America. In the movies and comics, Iron Man is Tony Stark, a billionaire arms manufacturer who finds redemption by building a lifesaving, heavily-armed tin suit. Birmingham, of course, has its very own version of Iron Man. Standing 20ft tall and weighing over six metric tons, it has a considerable height and weight advantage over 5’8” Robert Downey Jr. On the downside, our Iron Man is probably history’s laziest superhero as it has stood in exactly the same spot for over 20 years. Marvel’s Thor is the God of Thunder, the Asgardian Odinson and wielder of the mighty Mjölnir. By contrast, Thor Hammers Ltd are a family business based in Solihull and – according to their website – are "the UK’s, and possibly the world's, foremost manufacturer of quality soft-faced hammers and mallets." It goes on to say that "Thor Hammers reputation for quality is legendary and is backed up by being approved to ISO9002 since 1992." Sadly, the website makes no mention of the Norse Ragnarok or a mischievous step-brother. Do you know of any other Birmingham-based Avengers we can add to the list? Check out Birmingham's comic shops.